This new luxurious Trad range is inspired by the long-lost art of a good old-fashioned barbershop shave, with a twist of modern convenience and performance. With a range including Exfoliating Face Wash, Daily Face Balm, Shave Cream, and a refined Eau de Toilette, every aspect of his grooming regime is catered for. The clean, smooth and unforgettable Trad fragrance blends striking citrus with comforting lavender. 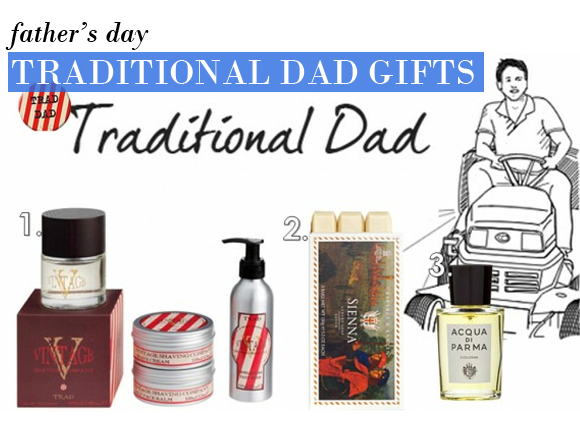 Treat your dad to these luxury vegetable-based soaps that are gentle on the skin, and subtly scented with a blend of leather, citrus and spice. Antioxidant vitamin E conditions and prevents dryness, while the gently foaming base is kind to the natural pH balance of the skin. These luxurious bars are packaged beautifully, and will last for a long time. Originally created in 1916, the skilfully blended Colonia fragrance was originally intended to scent the handkerchiefs of elegant men. This refreshing and distinctive scent of Sicilian Citrus, Bulgarian Rose, Lavender and Amber is one with a rich history, and has been worn by stars such as Humphrey Bogart, Cary Grant and Ava Gardner. Already know this product it's a firm favourire of my husband's! This entry was posted on Monday, June 13th, 2011 at 4:00 pm and is filed under Gifts. You can follow any responses to this entry through the RSS 2.0 feed. You can skip to the end and leave a response. Pinging is currently not allowed.